To remove the pain (and procrastination) of fulfilling state requirements. Keep your license, get on with your life. We want you to practice your professions without having to worry about whether you’re meeting the CE requirements of your state. Founded and developed by an Occupational therapist, two Physical Therapists, and two Speech and Language Pathologists, all subject to mandatory continuing education requirements for re-licensure. It began with a conversation about the issues involved in each state’s varying continuing education requirements and morphed into a software program designed to simplify the professional’s life and provide comprehensive services for continuing education companies and institutions. If I lost that piece of paper, I’d be out of luck. First, I have to make sure what the licensing board is requiring. Then I have to search to find the right courses. Meeting the requirements takes away time I could better spend on doing my job. In large organizations we have had to hire employees who do nothing but ensure that everyone has met the licensing board requirements. I came within 24 hours of not completing my CE because I misplaced the papers/got busy with work/forgot. So they decided to create a service that would allow professionals and continuing education providers to have access to each other. They designed a company that keeps clients informed of the requirements for their professions in their states, incorporates some great educational providers, keeps track of all records, and handles audits. We hope you will allow us to serve you. 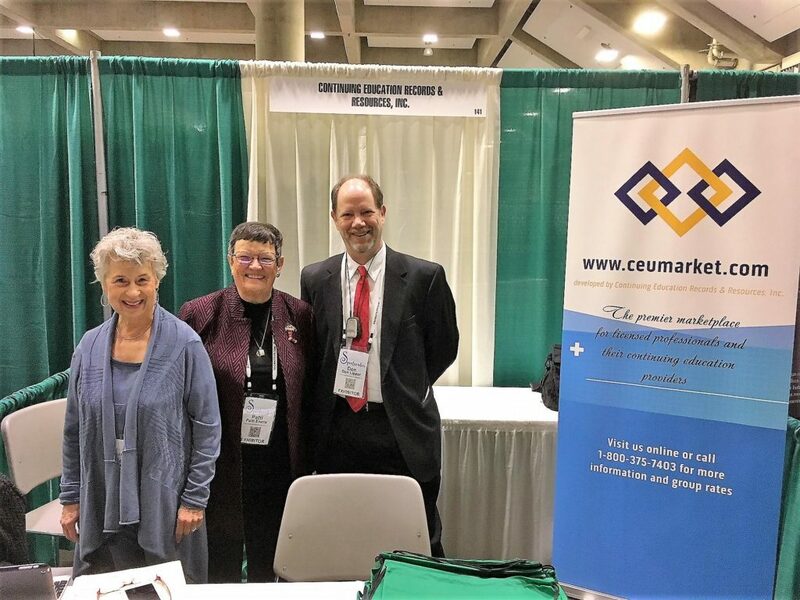 Robin Wand, Corporate Secretary, Member & Provider Services, Patricia Evans, CEO and Don Lipper, Chief Business Development & Technology Officer.